Lost in Thought, from Swansea, Wales, was formed in 2007 by guitarist David Grey and bassist Simon Pike with the desire to create fresh progressive metal. They found like minded conspirators in Nate Loosemore (v), Greg Baker (k), and Chris Billingham (d). On the strength of these eight songs they were signed to Sweden's Inner Wound Recordings for the release of their debut album Opus Arise. Rather grand and impressive are two words I would use for this debut. Between the caliber of song composition and musicianship, one would expect to hear this quality from a band with several albums under their belt. Other words to describe Opus Rise would by heavy, intense, powerful, and melodic. From the start, Beyond the Flames, Entity, and Blood Red Diamond, and Seek to Find echo these words. Beyond the Flames and Blood Red Diamond reverberate with melodic hooks that tickle your ears. At the midpoint LIT offers quite profound and arresting melodic heavy metal with soaring epic New Times Awaken. As the band finishes you hear those grand lush arrangements bolstered and driven by quite impressive and progressive metal. Delusional Abyss turns on a more conventional melodic heavy metal with softer segues. Lost in Thoughts starts with subtlety but quick turns to blistering, heavy metal finish. Assimilate, Destroy is, perhaps, the heaviest piece: beginning with some mideastern notes it burns into powerful piece that blends progressive power metal with some modern nuances. As to the progressive nature of Opus Arise, it's not overly complex: LIT is not trying to trick or confound you in their arrangements. Rather, they're hoping to draw you in and entertain. In the sense they are like their peers Threshold, Pagan's Mind, Circus Maximus, and even the legendary Dream Theater. Final words to describe Lost in Thought and Opus Arise are skillfulness and passion. To the former, these guys are really, really good and play well together. To the latter, the enthusiasm and energy of this band explodes from every performance. The words together easily define Nate Loosemore superb vocals; this guy is huge, a great metal singer. But the words apply to all things: band, songs, musicianship. 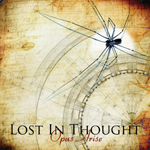 Lost in Thought's Opus Arise is genuinely exciting progressive metal, an impressive debut from a promising band. Strongly recommended! Lost in Thought's Opus Arise is genuinely exciting progressive metal, an impressive debut from a promising band. Strongly recommended!